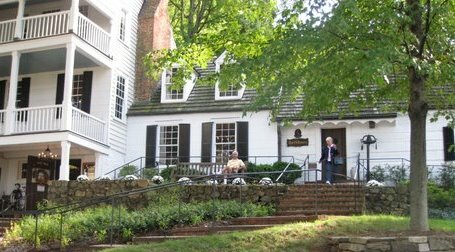 When starting our Presidential Tour of Charlottesville and the surrounding areas, we stayed at The Cavalier Inn at the University of Virginia in Charlottesville. This was a centrally located property within walking distance of the University. Offering a full breakfast and snacks throughout the day along with a business center, we found this to be a comfortable choice. Ash Lawn-Highland was the home of President James Monroe who held more offices than any other President. A self-supporting 535 acre estate boasts several special events, including the Summer Festival. Monroe purchased Ash Lawn-Highland because his friend Thomas Jefferson’s Monticello was close by. Today’s guests can enjoy the historic, refurbished home, elegant furnishings, garden, picnic spots, statue, and glimpses of Monticello. Michie Tavern is an 18th century inn that invites visitors to dine on a traditional southern luncheon meal served by period attired servers. Visitors enjoy period dishes like southern fried chicken, hickory smoked pork barbecue, black eye peas, stewed tomatoes, biscuits, and cornbread along with Virginia wines and lagers. Tours of the original Inn, the Virginia Wine Museum and Virginia Reel dance lessons are offered. We enjoyed the period food, the ambiance and the gorgeous grounds and handcrafts. The hospitality of the staff was exceptional and we were very blessed to pick up the Michie Tavern cookbook so we now can enjoy the recipes that weary travelers once savored at this amazing piece of history. The President’s Pass is available for travelers who want to combine a tour to Michie Tavern, Monticello, and Ash Lawn-Highland. You can purchase the pass online. Monticello named one of “the 25 must see sights in the US” by Travelers Magazine, the home of President Thomas Jefferson is an architectural masterpiece. Recent archaeological excavations and the Center of Historic Plants have drawn world wide attention. Jefferson was centuries ahead of his time as a botanist and his gardens,orchards, and vineyards are absolutely spectacular. He was also a gifted engineer with his inventions and even his designs on many aspects of this impressive home are mind-blowing. He was again, so ahead of their time. 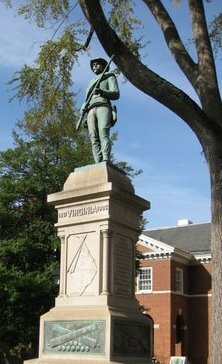 UVA, founded by Thomas Jefferson, is one of the most prestigious universities in the United States and was built by Jefferson as an academical village to enrich those seeking knowledge. We enjoyed visiting the special collections library to see the original Declaration of Independence broadsides. The UVA Rotunda was exquisite. Montpelier, the lifelong plantation home of President James Madison and his wife Dolly has a 200 acre, old-growth forest, archaeological sites, and cemeteries for the entire Madison family and slaves. This spectacular President’s home will always be one of our top favorites. 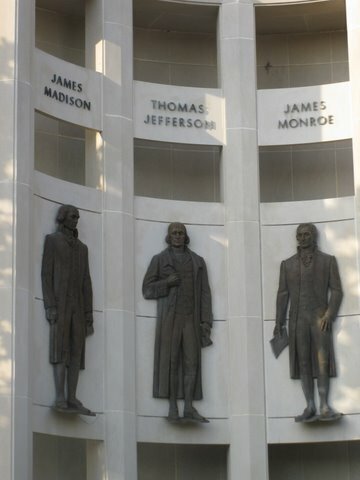 You can actually stand in the library where James Madison first envisioned the constitution. With an enormous number of educational exhibits and extremely friendly and helpful docents, we learned a great deal about the President and his history. We even enjoyed a delightful deli lunch at the snack bar where we were refreshed by healthy food choices as well as some not-so-healthy, decadent treats. The region, Orange County is a noted wine region with numerous romantic inns and vineyards throughout the gorgeous area. There are even romantic Montpelier Wine Weekends that can be booked as a package online. Walton’s Mountain Museum provides a step back to a simpler time and replicas of The Godsey’s Store, and sets of portions of the Walton’s home. Tours are available by appointment. For some of the best food in town try Downtown Thai in Charlottesville. Rarely do you find such outstanding food for such a reasonable price. Memorable salads, curries, soups and specials, along with freshly prepared starters, promise you’ll be pleased. You can choose mild, medium, hot, extra hot, or native Thai for your seasoning/spice level. The greater Charlottesville area and Orange County are literally brimming with treasures and finds for a road tripping couple. Arts, culture, shopping, history, festivals, wine tasting….a Presidential Road Trip awaits.